Celery is not just a high fibre, low fat food for dieters; it contains a wealth of vitamins, minerals and other health benefits in its own right. It can help reduce blood pressure and cholesterol, as well as prevent cancer via its multiple antioxidant components. Celery is also rich in Vitamin C, essential for boosting the immune systems of little people, who seem to bring home every nasty bug under the sun! Cut the celery stalk in half, so that you have two pieces or 'logs' of equal length. You might wish to remove the strings for babies. Spread your peanut butter of choice into the concave part of the celery. 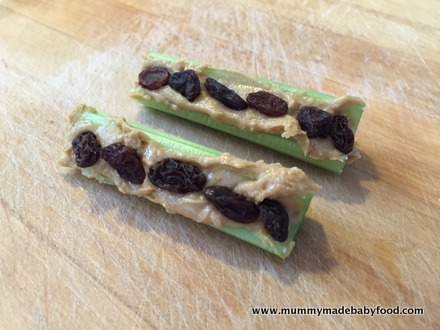 Place your raisins or 'ants' evenly across each piece of celery, and take a bite for a mouthful of crunchy, savoury and sweet deliciousness! 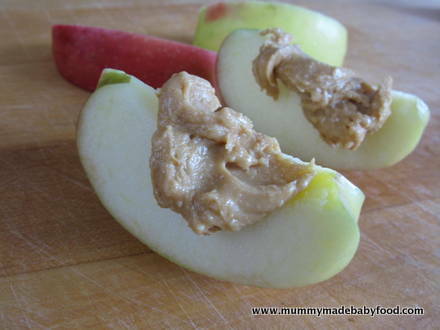 There are endless variations on this snack, which is great if your little ones love anything with peanut butter on it. Our household favourite is the crunchy variety, which is mostly smooth but has little bits of peanuts in it that you can crunch with your teeth. One of our family staples, which keeps me and the boys going throughout the day, is peanut butter on apple. I love the crisp sweetness of the apple together with the creamy richness of the peanut butter. Make sure you choose a firm-fleshed apple rather than a mealy one, to get the full benefits. We like to eat Pink Lady apples. For those with a real sweet tooth, or if you are using a more tangy apple, you could also add raisins to this one, but we usually eat it without. For a drier and more savoury option, try spreading peanut butter on a plain, unsalted rice cake. It instantly livens up something that might once have seemed boring and will make you look at it in a whole new light. And of course, peanut butter on toast, whilst traditional, is always a winner and perfect for breakfast, lunch or dinner.